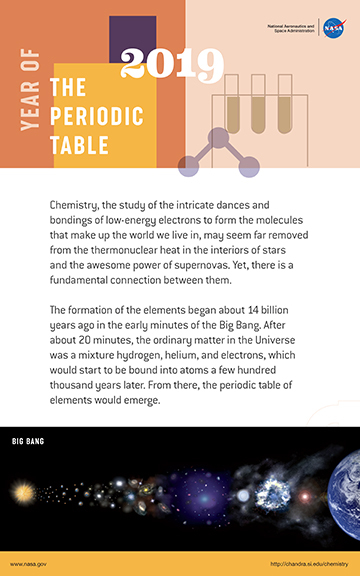 Chemistry, the study of the intricate dances and bondings of low-energy electrons to form the molecules that make up the world we live in, may seem far removed from the thermonuclear heat in the interiors of stars and the awesome power of supernovas. Yet, there is a fundamental connection between them. The formation of the elements began about 14 billion years ago in the early minutes of the Big Bang. After about 20 minutes, the ordinary matter in the Universe was a mixture hydrogen, helium, and electrons, which would start to be bound into atoms a few hundred thousand years later. From there, the periodic table of elements would emerge. In essence, the history of the formation of the elements can be divided into two main phases: one that ended after the first 20 minutes, and the other that has been ongoing since the formation of the first stars over 13 billion years ago. 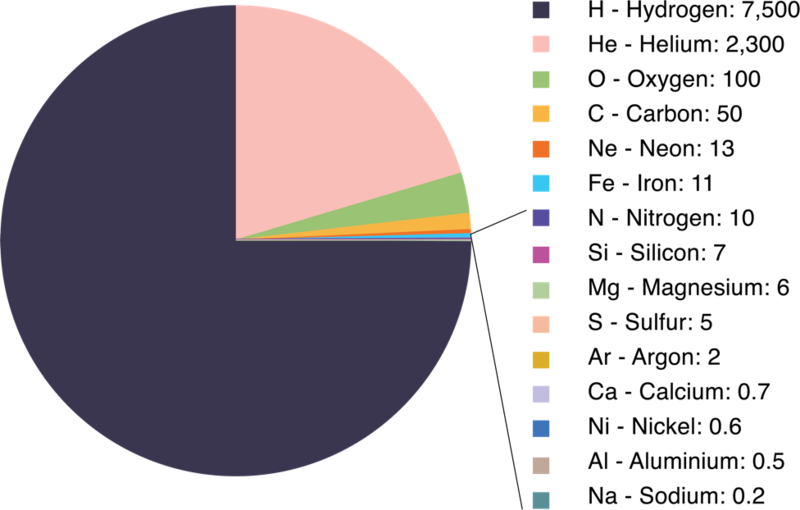 The pie chart below illustrates the average abundance by mass of the various elements in the Universe (called the cosmic abundances) in parts per 10,000. 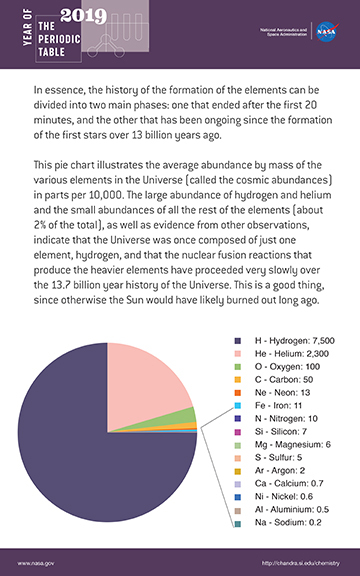 The large abundance of hydrogen and helium and the small abundances of all the rest of the elements (about 2% of the total), as well as evidence from other observations, indicate that the Universe was once composed of just one element, hydrogen, and that the nuclear fusion reactions that produce the heavier elements have proceeded very slowly over the 13.7 billion year history of the Universe. This is a good thing, since otherwise the Sun would have likely burned out long ago. Chemistry and astrophysics are intertwined on vastly different scales and in extremely varied types of objects. 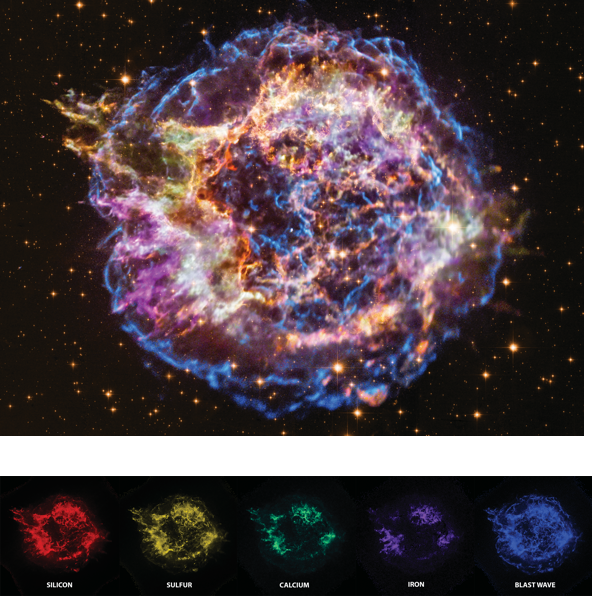 Data from NASA’s Chandra X-ray Observatory of exploded stars, for example, reveal clouds of gas rich in elements such as oxygen, silicon, sulfur, calcium and iron, and track the speed at which these elements have been ejected in the explosion. 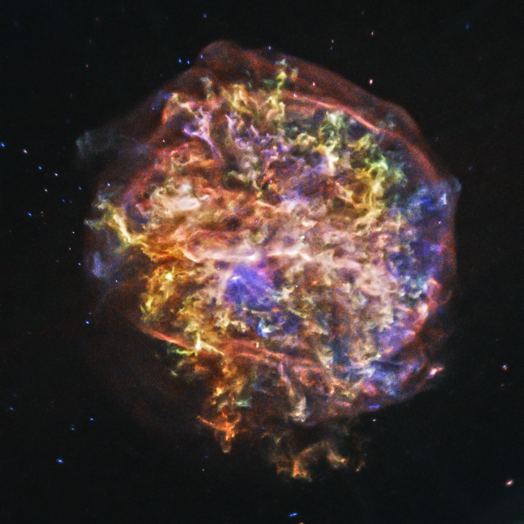 Astronomers believe that the G292.0+1.8 supernova remnant, one of only three in the Milky Way known to be rich in oxygen, was formed by the collapse and explosion of a massive star. Supernovas are of great interest because they are a primary source of the heavy elements believed to be necessary to form planets and life. 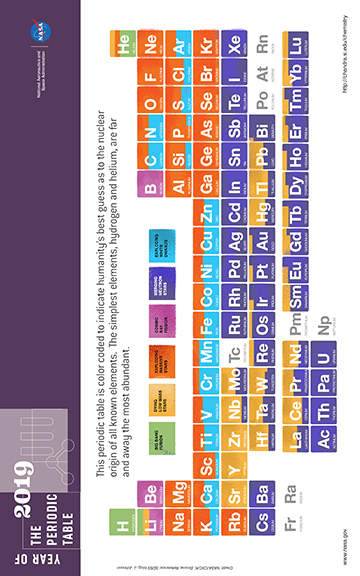 This periodic table is color coded to indicate humanity’s best guess as to the nuclear origin of all known elements. The simplest elements, hydrogen and helium, are far and away the most abundant. The hydrogen in your body, present in every molecule of water, came from the Big Bang. 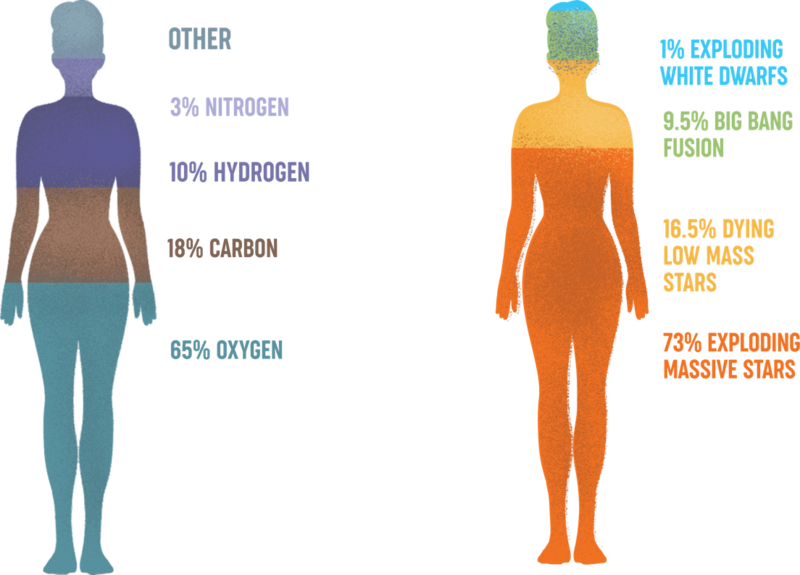 The carbon in your body was made by nuclear fusion in the interior of stars, as was the oxygen. Much of the iron in your body was forged during supernova explosions that occurred long ago and far away. 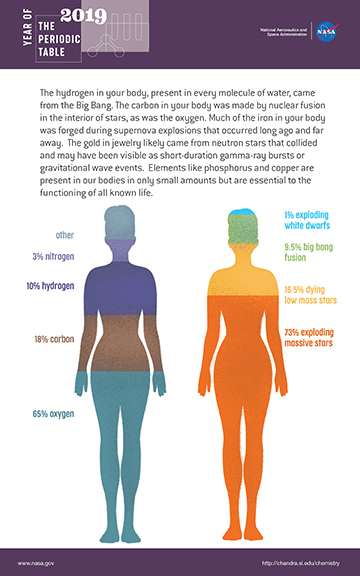 The gold in jewelry likely came from neutron stars collided and may have been visible as short-duration gamma-ray bursts or gravitational wave events. Elements like phosphorus and copper are present in our bodies in only small amounts but are essential to the functioning of all known life. 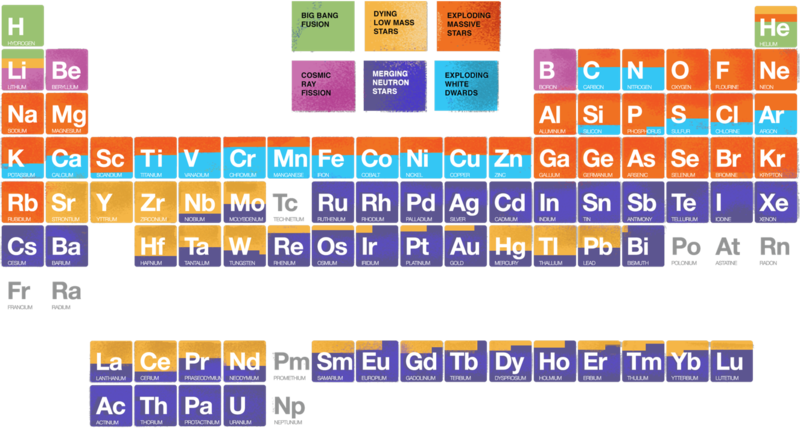 Most of the elements essential for life on Earth come from inside the furnaces of stars and the explosions that mark the end of some stars’ lives. 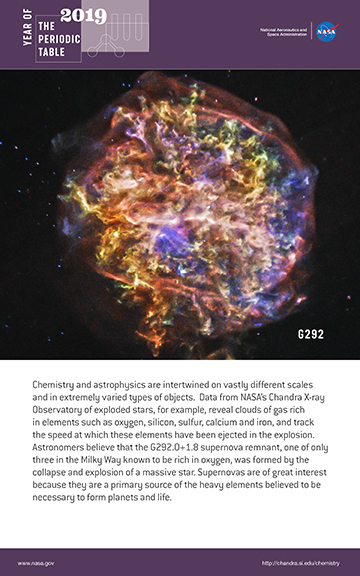 Astronomers have long studied exploded stars and their remains — known as “supernova remnants” — to better understand exactly how stars produce and then disseminate many of the elements observed on Earth, and in the cosmos at large. 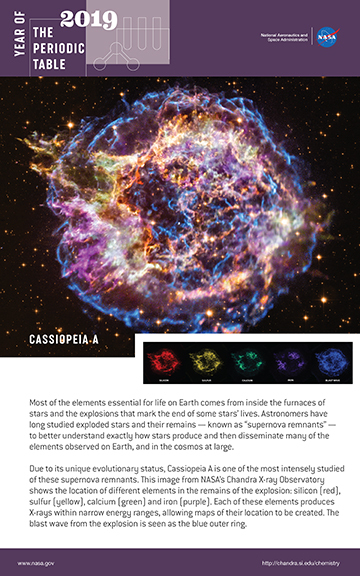 Due to its unique evolutionary status, Cassiopeia A is one of the most intensely studied of these supernova remnants. This image from NASA’s Chandra X-ray Observatory shows the location of different elements in the remains of the explosion: silicon (red), sulfur (yellow), calcium (green) and iron (purple). Each of these elements produces X-rays within narrow energy ranges, allowing maps of their location to be created. The blast wave from the explosion is seen as the blue outer ring. 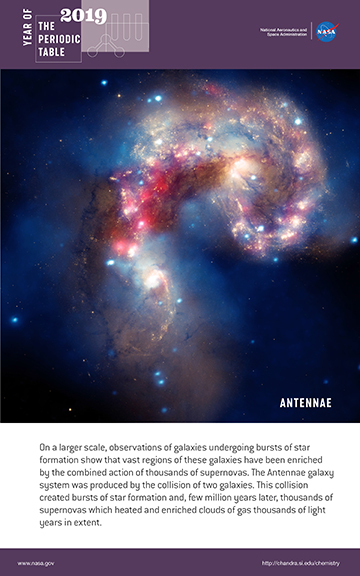 On a larger scale, observations of galaxies undergoing bursts of star formation show that vast regions of these galaxies have been enriched by the combined action of thousands of supernovas. 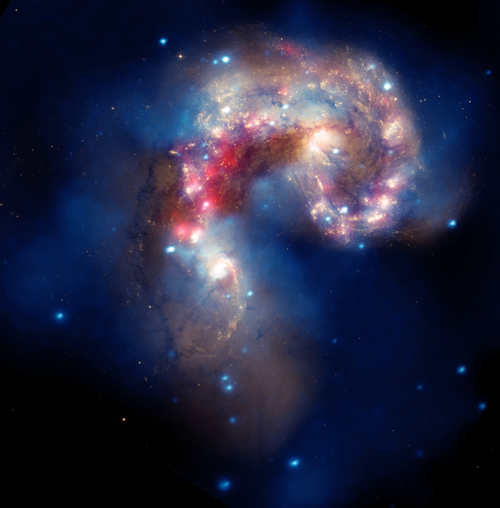 The Antennae galaxy system was produced by the collision of two galaxies. 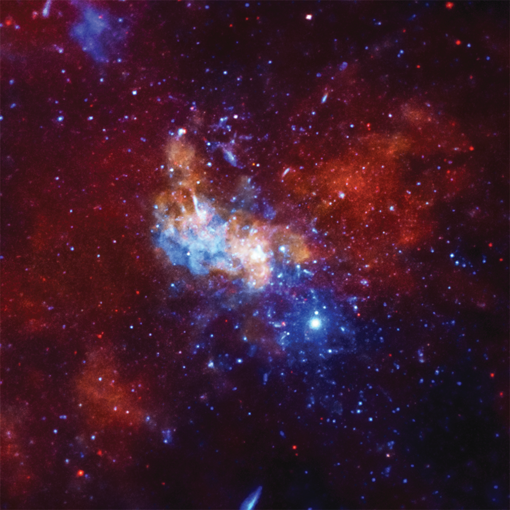 This collision created bursts of star formation and, few million years later, thousands of supernovas which heated and enriched clouds of gas thousands of light years in extent. 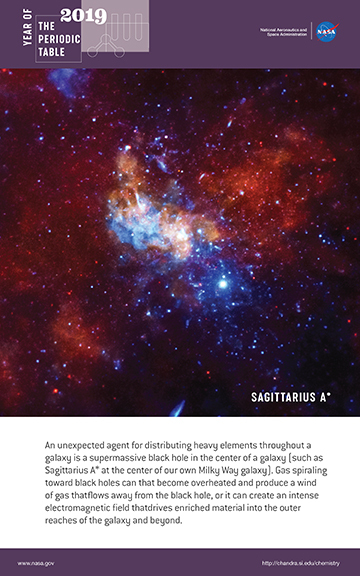 An unexpected agent for distributing heavy elements throughout a galaxy is a supermassive black hole in the center of a galaxy (such as Sagittarius A* at the center of our own Milky Way galaxy). Gas spiraling toward black holes can become overheated and produce a wind of gas that flows away from the black hole, or it can create an intense electromagnetic field that drives enriched material into the outer reaches of the galaxy and beyond. 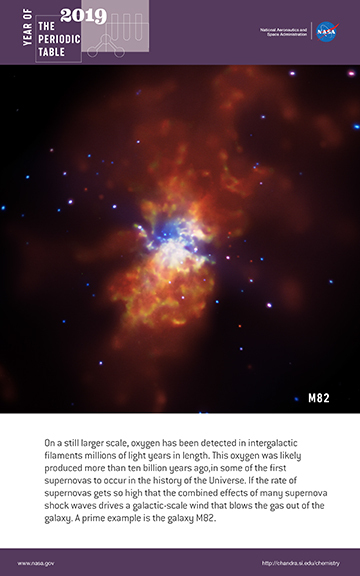 On a still larger scale, oxygen has been detected in intergalactic filaments millions of light years in length. This oxygen was likely produced more than ten billion years ago, in some of the first supernovas to occur in the history of the Universe. If the rate of supernovas is high enough, the combined effects of many supernova shock waves can drive a galactic-scale wind that can blow the gas out of a galaxy. 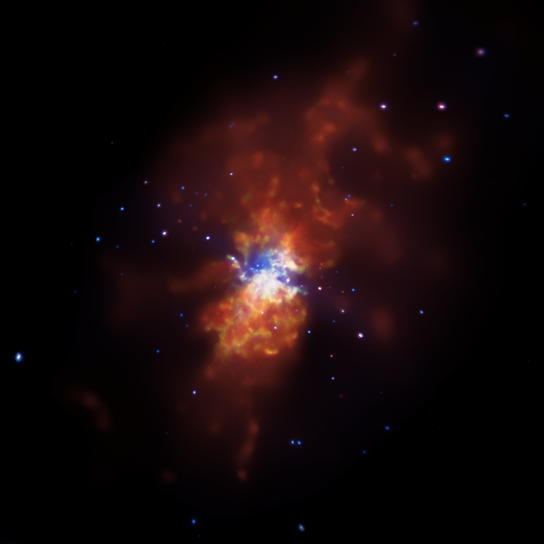 A prime example is the galaxy M82.